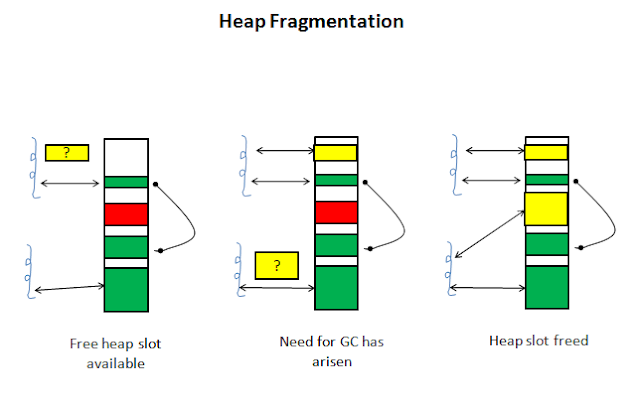 Getting the brief information on heap this post, I will move on to Garbage Collection in JVM. I have tried to understand Garbage Collection and here is the brief information on the same. When an object is no longer referenced by a program, the heap space it occupies it can be recycled so the space is made available for subsequent new objects. The JVM has to to keep tracking which objects are being referenced by the program which is executed, and finalize and free unreferenced objects at run time. This activity will need more CPU time than what it requires when program explicitly free unnecessarily occupied memory. How to optimize the CPU usage by the program is key in designing of the product so product can still do better when CPU is loaded in a given context. The heap fragmentation occurs gradually as the program execution happens. The new objects are allocated and the unreferenced objects are freed. The freed portions of heap memory are left in between portions occupied by live objects. In this case, the request to allocate new objects will be filled by extending the size of the heap even though there is sufficient unused total space in the existing heap. And this is possible if there is sufficient contiguous free heap space available into which the newly created object can fit. The swapping is required to service the growing heap and this can degrade the performance of the program which is in execution. Now, I will leave it to you to consider what and how will the impact be from heap fragmentation in desktop and mobile device, running on lower RAM. Have you ever noticed message saying "Out Of Memory" or "running out of memory"? 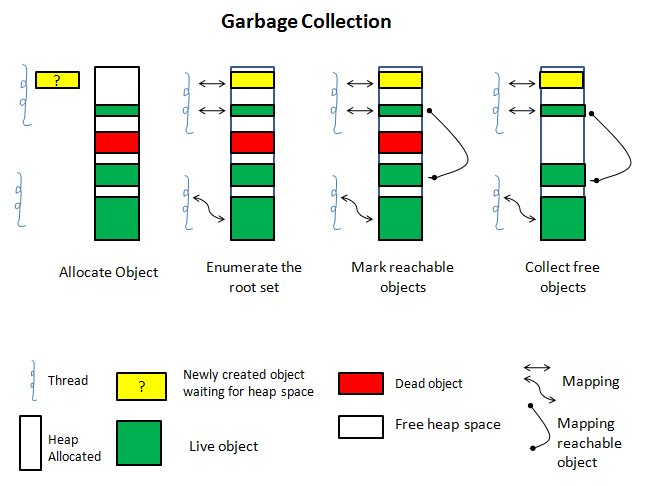 With the garbage collected dead objects, the problem is, it can impact the performance of the application/program. The JVM has to keep track of the objects being referenced by the executing program/application and finalize the unreferenced objects (dead objects) in run time. All this happens on the fly while one uses the program/application. This activity can consume the CPU scheduling time. What if the program/application itself freed the memory? Won't it consume the CPU, then? Both consumes but how much is the question. It depends on the code of the application/program and the hardware as well. I'm not sure if one can handle the CPU scheduling in garbage collection process to free the dead objects. If it is possible to handle the CPU scheduling in this context, programmers should have the constraints and limitations; else by this time most of the app would have been better in GC environment if the CPU scheduling was in full control to the written code of program/app.